THIS CHAPTER DISCUSSES THE REASONS WHY CANADIAN BUSINESSES AND GOVERNMENTS NEED TO ADOPT LIFE CYCLE APPROACHES. THREE KEY REASONS HAVE EMERGED: (1) INTERNATIONAL COMPETITIVENESS, (2) PUBLIC SECTOR LEADERSHIP, AND (3) FIRM COMPETITIVENESS. INTERNATIONAL COMPETITIVENESS INCLUDES ADDRESSING MARKET ACCESS AND TRADE ISSUES BASED ON THE REQUIREMENT OF LIFE CYCLE APPROACHES ALONG THE SUPPLY CHAIN IN THE VARIOUS JURISDICTIONS WHERE THE BUSINESSES OPERATE. PUBLIC SECTOR LEADERSHIP INVOLVES INTEGRATING LIFE CYCLE APPROACHES IN STRATEGIC AREAS OF PUBLIC SECTOR INTERNAL OPERATIONS, INCLUDING POLICY AND PROGRAM DECISION-MAKING. FIRM COMPETITIVENESS RELATES TO USING LIFE CYCLE APPROACHES TO REALIZE PROCESS EFFICIENCIES IN INTERNAL BUSINESS OPERATIONS AND SUPPLY-CHAIN MANAGEMENT. Several key drivers are increasing the use of Life Cycle Approaches in Canada, including market factors, trade issues and regulations. The growing demand from many business sectors for life cycle data and information along their supply chain is causing the market to respond by increasing the adoption of these approaches by Canadian companies that see opportunities to compete. Potential trade barriers from jurisdictions applying life cycle requirements on products sold in their country, province or state are also driving this uptake, creating new risks to existing customer relationships. The incorporation of life cycle information in policy formation and purchasing in the public sector is creating regulations that require companies to respond by increasing their own use of these approaches. Of greatest importance to Canada is the risk to international competitiveness, followed by the opportunity for enhanced public sector leadership and firm competitiveness. 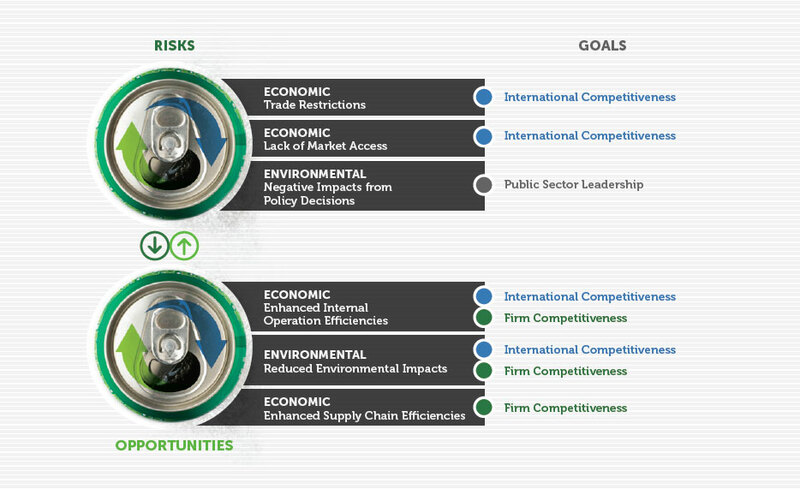 The Canadian public and private sectors are exposed to various economic and environmental risks and opportunities related to Life Cycle Approaches. Of greatest importance to Canada is the risk to international competitiveness, followed by the opportunity for enhanced public sector leadership and firm competitiveness (Figure 5). Failure to adopt Life Cycle Approaches creates risks to Canada’s economic competitiveness, including potential market access and trade restrictions as the use of Life Cycle Approaches becomes more prevalent in other nations. From an opportunities perspective, the increased adoption of Life Cycle Approaches can improve supply chain and internal operation efficiencies resulting in enhanced innovation, cost reductions and stronger public funds management. Life Cycle Approaches also support environmental stewardship through increased environmental efficiencies and better integration of environmental attributes in decision-making processes.